Load Impact is a leading cloud-based load testing system employed by thousands of companies from all over the world to help them map out and create their websites, mobile applications, web-based apps, and APIs by performing series of performance tests indicative of the load capacity and stress endurance of your systems, among other things. Big names in the business and technology industries have trusted Load Impact for their load testing needs, including JWT, NASDAQ, The European Space Agency and ServiceNow. 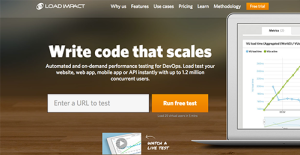 Load Impact has administered over 1.2 million load tests and is the trusted load testing application many developers and active users. Load Impact deploys a simple user interface but past that are powerful tools that allows users to gain insights of the performance and endurance of their websites and applications as well as determine issues and bottlenecks that slow and impede the delivery of services. There is a reason why many companies and developers choose Load Impact to test the stress and capacity of their websites, mobile and web-based apps, and APIs. Below are just some of the benefits Load Impact provides its users. Realistic load tests. Load Impact is capable of running more load tests that mirror reality in contrast to other leading load testing tools. Reliability. With more than 1.2 million load tests performed (and counting), Load Impact test results are far more reliable and accurate, thus giving clients the information and insights they need to create better websites and improve their mobile and web-based applications. Global load. In just a single test, Load Impact can generate load from up to 10 different geographical locations from all over the world simultaneously. Heavy measuring. Load Impact does the heavy lifting in terms of calculating the response rate of every transferred resource. At this level, clients can gain high quality insight that allows them to determine and resolve issues immediately. Load Impact also measures CPU usage, Memory usage, Disk I/O and Network I/O. Each enterprise has its own characteristics, and might need a special Business Intelligence Software solution that will be designed for their business size, type of clients and staff and even particular niche they deal with. It's not wise to count on getting a perfect app that will work for every company regardless of their history is. It may be a good idea to read a few Load Impact reviews first and even then you should keep in mind what the solution is supposed to do for your business and your workers. Do you need an easy and straightforward solution with only basic features? Will you actually make use of the advanced functionalities needed by experts and large enterprises? Are there any particular features that are especially beneficial for the industry you operate in? If you ask yourself these questions it is going to be much easier to get a solid software that will match your budget. How Much Does Load Impact Cost? We realize that when you make a decision to buy IT Development Software it’s important not only to see how experts evaluate it in their reviews, but also to find out if the real people and companies that buy it are actually satisfied with the product. That’s why we’ve created our behavior-based Customer Satisfaction Algorithm™ that gathers customer reviews, comments and Load Impact reviews across a wide range of social media sites. The data is then presented in an easy to digest form showing how many people had positive and negative experience with Load Impact. With that information at hand you should be equipped to make an informed buying decision that you won’t regret. What are Load Impact pricing details? What integrations are available for Load Impact?